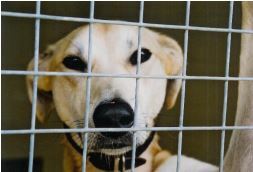 How to choose a dog from a rescue centre with your head and your heart! These guidelines are intended to help you think about how you choose your new dog, especially if you have not had a dog before. Most rescue centres offer excellent advice about which dogs suit which owners, so do ask for help and information from the staff when choosing a dog. When you have chosen a dog, ask if you can take him out, but don’t just take him for a walk! Sit down with him so you can observe his behaviour and see how quickly he settles down in your company and how much he enjoys just being with you – this should be the start of a beautiful relationship, so take the time to make sure it’s right! If you have children, it is essential that the dog genuinely loves them – tolerance is just not enough! Size – think about the dog’s strength as well assize! Coat length – grooming takes time and not everyone likes hoovering every day! Age – pups are fun but the time and training they need is intense. Older or even elderly dogs can be hugely rewarding and fit into a daily routine easily. Do NOT choose a dog just because it looks cute or reminds you of a dog that you have known! Choosing a dog is like choosing a partner – select on looks alone and you’ll be quickly disappointed! Positive signs of good temperament and sociability are easy to confuse with over-excitement and arousal. Tail wagging does not always mean friendliness: barking does not always constitute a threat. When in the kennel, the dog wants to approach you and make contact by pressing its muzzle or body against the bars. If you move your hand, does the dog follow and try to maintain contact? The dog’s body looks soft and wiggly. Facial expression is‘soft’. Eye contact is often squinty. The tail shows how a dog is feeling – low, quick wags may indicate uncertainty – tails that go round and round are usually showing pleasure and excitement. Once out of the kennel, does the dog give you attention? Social dogs want to solicit your attention – they will lean on you, nudge you gently and show affection, not just excitement. Dogs that ignore you. Don’t be fooled by the idea that the dog has been cooped up in a kennel and therefore finds everything else distracting – if he’s sociable, he’ll be thrilled to have a human to give him attention. If you stroke him, he should ask for more, not move away.